Then one disgruntled customer starts a rant. Whether a result of an honest mistake (yes, even the best of companies make those), a misunderstanding, or a person who just likes to stir up drama, you now have a negative mark marring your online reputation. Instead of contacting you, as they should have, they may have posted it on social media, like Facebook or Twitter. Maybe they tagged you in their posts and want you (and your audience) to see it, or maybe they prefer to post behind your back and publish their gripes to their own social media followers. They may complain on consumer forums, in a blog post, or within other blogs’ comments. Often these rants show up on Yelp, Google Reviews, or various business directories. Reading bad reviews always stings a little, but it may also be tempting to write off these rant-like posts, especially if you already have good reviews or positive content posted elsewhere. But think about the last few purchases you made on Amazon. How many user reviews did you read? Did your opinion of the product change after reading them? Did it make you reconsider the claims in the product’s description? Do keep in mind the latest research, showing that 84% of people trust an online review as much as (if not more than) a personal recommendation from friends or family. Some consumers go straight to the bad reviews and read them first. What’s a well-meaning business to do? These situations demand careful attention, as attempting to deal with a disgruntled customer or group, especially in such a public manner, can often backfire and elicit further derogatory language about the business you’ve worked so hard to cultivate. 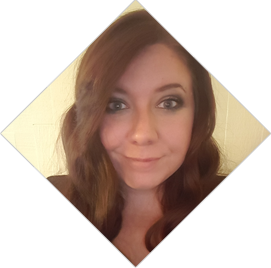 But there are proven strategies, based on customer service and content marketing best practices, that can help both prevent and mitigate this kind of reputational damage. Even before you ever see a negative review (and you will—no business is troll-proof! ), work to establish a down-to-earth, conversational tone when it comes to customer relations. Within your brand language and marketing content, make sure it is clearly articulated that you want feedback, as it’s the only way businesses can truly grow. Assure your audience that their satisfaction is the reason you’re in business—if there are things to improve, you rely on customers to let you know. Make it incredibly easy to contact customer service. Have contact links visible and accessible on each webpage or social media account. Use prominent call-to-action buttons with simple forms. If you don’t already have a live chat option, now’s the time for its debut. Whichever methods you choose, make sure your customer service representatives are prepared to answer feedback quickly and courteously. Post content in social media and on your blog that invites customer interaction. Ask questions, ask for feedback, post a fun quiz, or run free trials for testing new products. By letting your audience know you want them involved, they are more likely to respect your business and direct concerns through proper channels. Keep tabs on your market. To truly know how your reputation stands across the digital marketplace, you have to monitor what’s being said in the vast “consumerverse.” A good place to start is by googling your own business. Do you find anything that concerns you? Perhaps you will notice common questions or concerns you can address in your content marketing. Search results about your business will change over time, and you never know when negative reviews can pop up. Checking in on online conversations has to be done regularly. To begin your monitoring process, set up Google Alerts to let you know when your business or product names appear in online conversations and if posts or sites are linking to you. If your business is larger, has many products or services, or has a more complicated customer base, several more advanced tools are available for monitoring your reputation online. Some have free options, such as Talkwalker and Go Fish Digital Complaint Search. Other reputation management tools may have a low monthly fee or tiers of service. They offer more intricate search and alert capabilities that keep a regular watch for conversations related to your business. You may already subscribe to content related to your industry. It can also be smart to subscribe to consumer reports or other opinion content that helps you keep tabs on what customers prioritize, what questions they ask, and what they generally complain about. Respond to your customers’ feedback—both positive and negative. If you made an honest mistake, remember that all businesses are run by humans (AI hasn’t taken over completely, yet!) and even the most careful humans make mistakes. Unforeseen events happen, technical difficulties arise, and sometimes a small oversight creates a big problem. Acknowledge your mistake, affirm the customer’s feelings, and let them know how you will ensure this doesn’t happen again. If appropriate, make them an offer for their return visit, purchase, trial, etc. For example, Forbes covered a situation when Target was called out by a customer on Twitter for the way they labeled a plus-size clothing item. 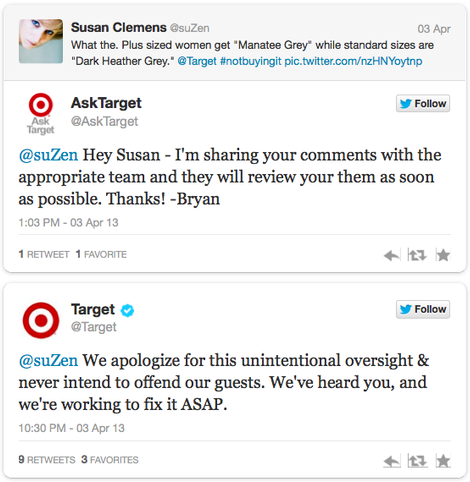 Target’s customer service kicked into gear, not hesitating to apologize even as they explained what happened in conversations with the customer over email. They also got a chance to emphasize their commitment to customer service, and ended with a simple yet satisfactory, “We've heard you, and we’re working to fix it ASAP.” Sometimes a response like this is all a slighted customer wants to hear. If a customer is being unreasonable, it’s still important to respond as soon as possible—ideally within a day over email, and within hours over social media. Do not ignore them! No matter how tempting, don’t call them out on their drama or make them feel stupid—do reemphasize what your products are meant to do and how they are recommended to be used. Often, user error can be easily deduced when readers are reminded of a product’s intended use as opposed to how the tricky customer was trying to use it. Do include an apology that the customer did not receive what they expected, but be careful venturing much further than that. Online reputation management is clearly an ongoing, careful process that must be handled in an empathetic yet professional manner. 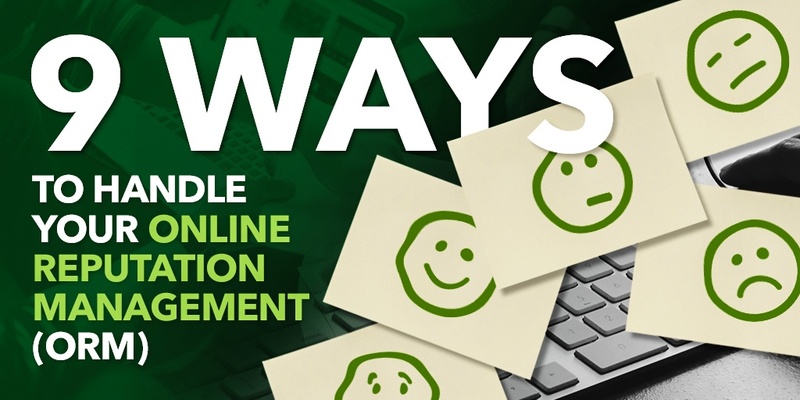 There are numerous factors to consider and different methods for handling negative content depending on the industry, the size of your business, and the type of product or service you sell. This is why many businesses hire an agency that handles each of these facets of online reputation management, starting with brand identity and strategic content marketing to boost customer engagement, then continuing into effective monitoring methods, and using best practices in public relations if things become escalated. Whatever the situation for the business you’ve worked hard to build, take some comfort in knowing that there are tactics and tools that can come to the rescue when your business falls under e-attack. At times, customer content crises can even present an opportunity to show just how good a business you truly are. Have you fallen victim to a bad review from a disgruntled customer? Want to learn how you can safeguard your online reputation? We’d love to discuss your business’s needs and determine the best strategy for restoring and upholding your online reputation—so you can avoid the hassle and headache. 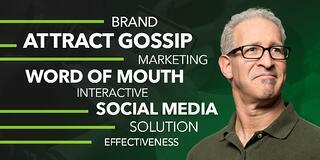 Contact i7 Marketing today.